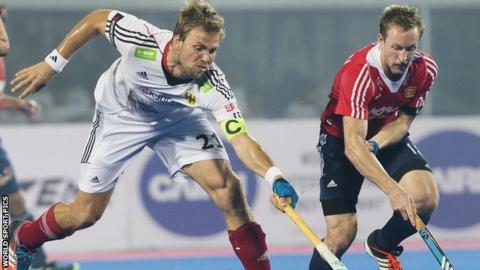 England suffered a shock 2-0 defeat to Germany in the quarter-finals of the Champions Trophy in Bhubaneswar, India. Germany finished bottom of their pool during the group stage, while England had topped theirs and had been among the favourites to win the event. Moritz Furste put Germany ahead before Christopher Ruhr sealed the win in the final quarter. England now face Argentina on Saturday to decide whether they will play off for fifth place or seventh place. England played the match without key players David Condon and Chris Griffiths, who were absent due to illness. "Maybe playing with two fewer players affected that, however we are not looking to make excuses for the overall outcome," said England head coach Bobby Crutchley. Sam Ward and Nick Catlin had half-chances at the end of the first quarter for England, but Germany netted the opening goal of the game through captain Furste just before half-time. Mark Gleghorne was penalised for a trip on Benedikt Furk and the German skipper arrowed the penalty corner into the top corner of George Pinner's goal. Adam Dixon missed an opportunity to level four minutes into the final quarter when his shot on the turn inched past the far post before Ruhr wrapped up the victory when he converted Mats Grambusch's cross. Germany will now meet Australia in Saturday's semi-final. The Kookaburras beat Argentina 4-2 in their quarter-final on Thursday as Graham Reid's side seek a sixth consecutive Champions Trophy title. India will face Pakistan in Saturday's second semi-final after the hosts beat Belgium 4-2 in their last-eight meeting.